Mary Keitany once tried to win a New York City Marathon by surging to a huge lead from the start. By staying patient Sunday, she ensured she'd be far ahead at the end. Stanley Biwott won his first major marathon title to complete the Kenyan sweep. He finished second in London last year and had been upping his mileage in training to ensure he didn't fade over the final stages of races as he had in the past. "Today it helped me a lot, and I believe in the program," Biwott said. He certainly needed that late speed against countryman Geoffrey Kamworor, who's more a track star than a marathoner. Kamworor won the silver medal in the 10,000 meters at the world championships in August. In 2011, Keitany led by nearly 2 1/2 minutes at the 15-mile mark but faded to her second straight third-place showing. A two-time London Marathon champ, she finally won in New York last year by just 3 seconds, matching the closest finish in the history of the women's race. Confidence was high coming into Sunday's race, but no matter how good she felt, Keitany knew to bide her time. "At the beginning, I did not go because I know the course in New York," she said. "Many times I had run it. So I said, 'Let me just wait.'" She waited until about 21 miles to make her move. "I say, 'OK, let me just go, and if somebody is more strong, she can come, and we can go,'" Keitany recalled. "I was ready to go with her, but fortunately they never got me. So I just crossed the line alone." Keitany finished in 2 hours, 24 minutes, 25 seconds, beating Ethiopia's Aselefech Mergia by more than a minute. Another Ethiopian, reigning London Marathon champ Tigist Tufa, took third, bothered by pain from her shoes. Biwott won in 2:10:34, beating Kamworor by 14 seconds. "I race to win, but I'm happy about the second position," Kamworor said. "I'm looking forward in the future, maybe next year, I'll come back again and work hard to win a New York Marathon." 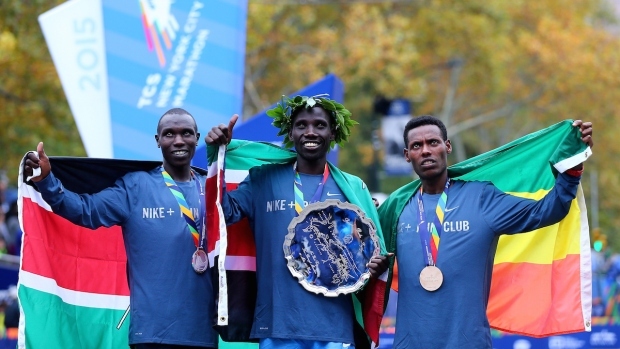 Desisa and Kipsang both ran the marathon at the world championships 10 weeks ago, though Kipsang didn't finish because of the heat in Beijing. 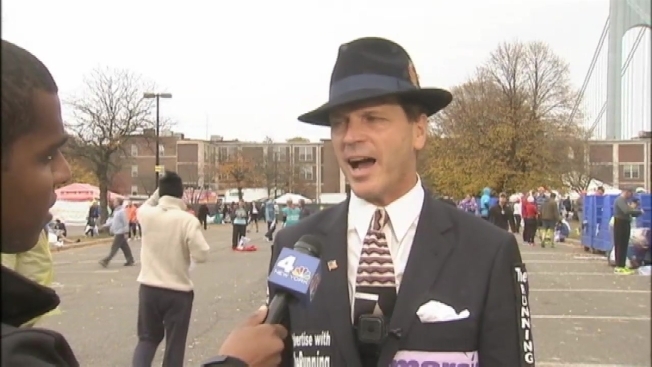 An unofficial total of 50,229 entrants started the 45th running of NYC Marathon. Spike Lee served as just the third grand marshal in the race's history, riding along the 26.2-mile course through the five boroughs in a 1969 Chrysler 300 convertible. American Meb Keflezighi, the 2009 champ, finished seventh at age 40 in his 10th NYC Marathon. His time of 2:13:32 was a national masters record. Keflezighi plans to run at the U.S. trials Feb. 13 to try to make his fourth Olympic team. Fellow American Laura Thweatt was also seventh in her marathon debut. She will seek to qualify for next summer's Rio Games on the track. Kenya doesn't hold trials, and with many more elite marathoners than the three slots allotted, there's no guarantee even an athlete as accomplished as Keitany will make the team. "I'm ready to go to try to get the medal in Rio next year," she said. "It would mean a lot to me and also to my life."